President Donald Trump criticized the National Football League Sunday morning ahead of the league's first full day of the season, claiming that viewership for NFL games is down and suggesting that if players "stood proudly" for the National Anthem "ratings could come back." "Wow, NFL first game ratings are way down over an already really bad last year comparison," the president tweeted Sunday morning, repeating a claim he previously made about NFL ratings last season. "Viewership declined 13%, the lowest in over a decade. If the players stood proudly for our Flag and Anthem, and it is all shown on broadcast, maybe ratings could come back? Otherwise worse!" ABC News could not immediately confirm the NFL's viewership numbers. This is the latest in a months-long campaign that the president has waged against the NFL, lambasting the league for allowing players to kneel during the national anthem. There's no sign that protests are letting up. Ahead of their game against the Tennessee Titans on Sunday, Miami Dolphins wide receivers Kenny Stills and Albert Wilson, who protested during the preseason, became the first players to take a knee during the 2018 regular season. They were the only players to do so during Week 1. Meanwhile, Miami defensive end Robert Quinn raised his fist. At a campaign event in Alabama on Sept. 22, 2017, Trump called on NFL owners to fire players who take a knee, suggesting they say, "get that s-- of a b---- off the field! He's fired, he's fired!" 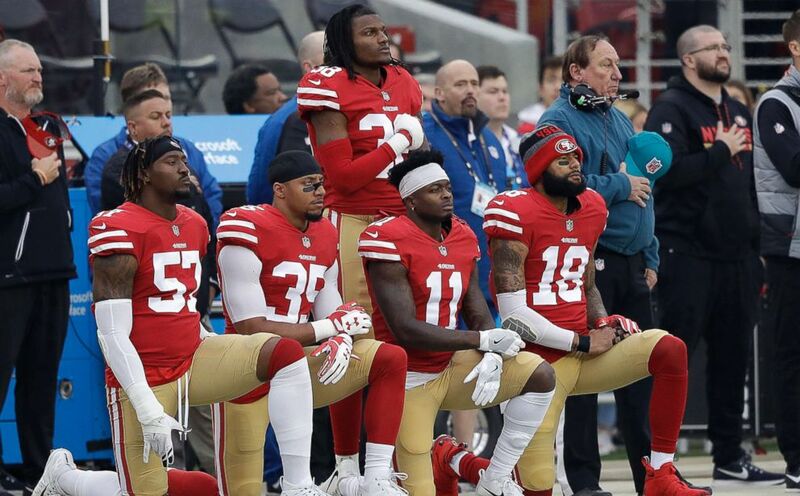 Several players have continued to raise their fists or take a knee during the NFL’s 2018 preseason to protest police brutality against black people and people of color. Last month, the president blasted NFL players who protested during preseason games, and suggested that they should be "suspended without pay." San Francisco 49ers' Eli Harold (57), Eric Reid (35) and Marquise Goodwin (11) kneel during the national anthem before an NFL football game against the Houston Texans, in Houston, Dec. 10, 2017. “The NFL players are at it again - taking a knee when they should be standing proudly for the National Anthem. Numerous players, from different teams, wanted to show their “outrage” at something that most of them are unable to define. They make a fortune doing what they love......,” he tweeted. Earlier this week, the president dove into a heated debate over a new "Just Do It" Nike TV ad starring former San Francisco 49ers quarterback Colin Kaepernick, who was propelled into the national spotlight in 2016 for being the first NFL player to take a knee during the national anthem. "What was Nike thinking?" Trump tweeted on Friday, again injecting himself into the debate. The Nike ad, which aired during the NFL season opener on Thursday night, shows a picture of Kaepernick overlaid with the words: "Believe in something. Even if it means sacrificing everything." 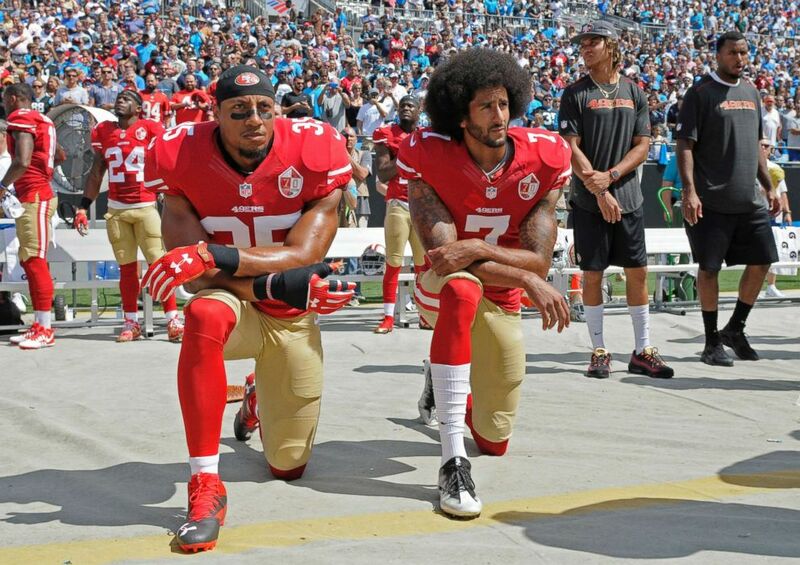 Kaepernick, who hasn't played in the NFL since 2016, filed a grievance against league owners last year alleging that they colluded to ensure that he remains unsigned. He has become a symbol of the modern civil rights movement and a pariah among some conservatives who accuse him of being unpatriotic. The backlash against the NFL from Kaepernick supporters and a firestorm against players who take a knee have prompted boycotts of NFL games from both sides over the past two seasons. Trump has repeatedly fueled the controversy on Twitter and during public appearances, decisively opposing Kaepernick and players who followed in his footsteps. 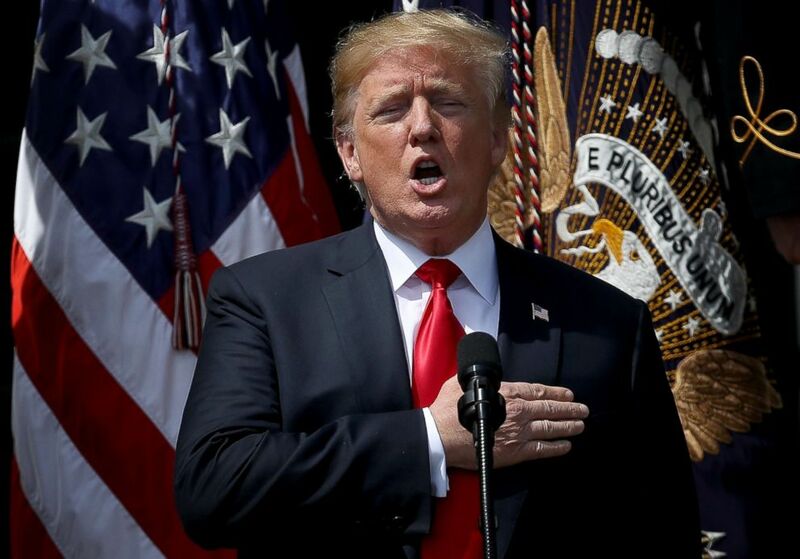 President Donald Trump sings the national anthem during a "Celebration of America" event on the south lawn of the White House on June 5, 2018 in Washington, D.C. 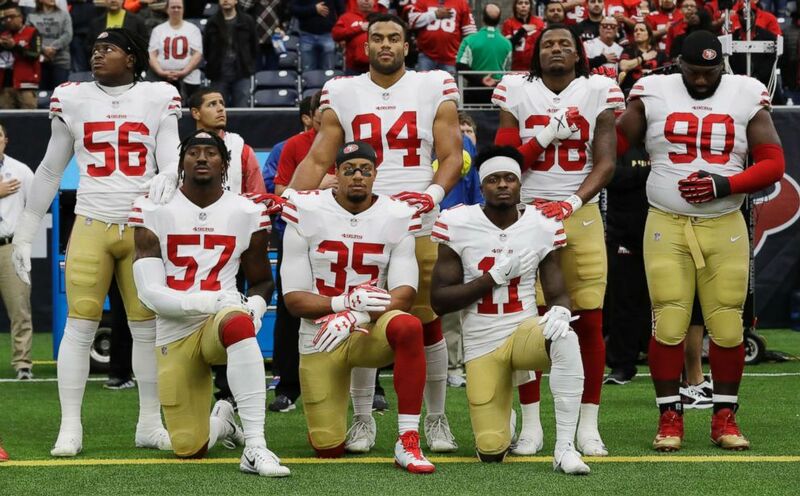 In May the league approved a new national anthem policy that requires players to stand for the anthem if they are on the field, but gives them the option to remain in the locker room. "I think that's good," Trump told Fox News in May. "I don't think people should be staying in locker rooms but still I think it's good, you have to stand proudly for the national anthem. Or you shouldn't be playing, you shouldn't be there. Maybe you shouldn't be in the country." 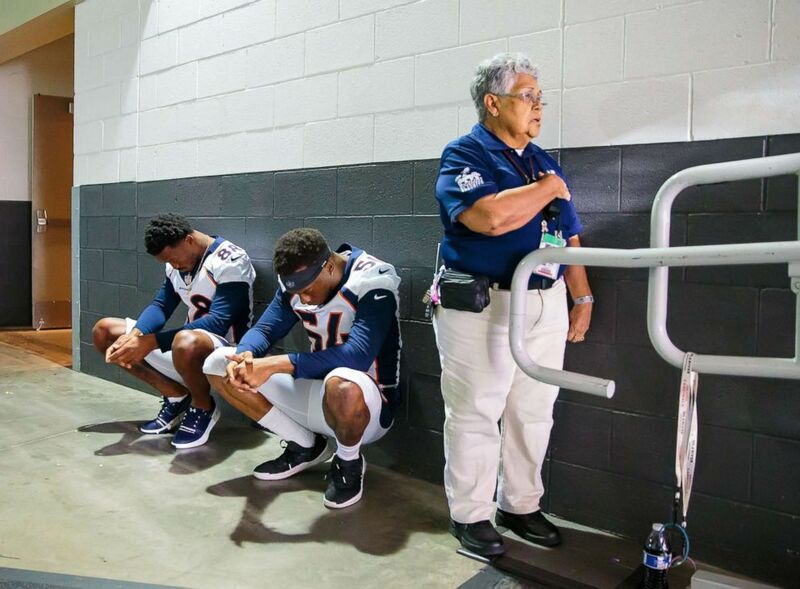 A stadium security guard stands with her hand over her heart as Denver Broncos linebacker Brandon Marshall (54) and wide receiver Demaryius Thomas (88) sit in silent protest during the national anthem prior a game, Aug. 30, 2018 in Glendale, Ariz. But according to an ESPN report on Sunday, the NFL is not expected to implement the new policy this season amid opposition from some players, and it was put on hold so that the league and the Player's Association can further discuss the matter. When asked by ABC News if they could confirm the report, the NFL said they did not. "Nothing has changed as the NFL and NFLPA continue its constructive dialogue. We are continuing our work to address the social justice issues raised by players," NFL spokesman Brian McCarthy wrote in an email. San Francisco 49ers' Eli Harold, Eric Reid, Marquise Goodwin and Louis Murphy kneel during the national anthem before an NFL football game against the Jacksonville Jaguars in Santa Clara, Calif., Dec. 24, 2017.